Peter Dickinson lives in Hampshire with his second wife, author Robin McKinley. His son is writer John Dickinson. He has written more than fifty novels for adults and young readers. He has won both the Carnegie Medal and the Whitbread Children’s Award twice, and his novel The Blue Hawk won The Guardian Award in 1975. Read excerpts at Peter Dickinson’s website. CLICK HERE FOR MORE BOOKS BY PETER DICKINSON. The Changes — (1968-1970) Young adult. Publisher: This is the time of The Changes — a time when people, especially adults, have grown to hate machines and returned to a more primitive lifestyle. It is a time of hardship and fear! When 16-year-old Geoffrey, a “weathermonger” starts to repair his uncle’s motorboat, he and his sister Sally are condemned as witches. Fleeing for their lives, they travel to France — where they discover that everything is normal. Returning to England, they set out to discover why the country is under this mysterious spell. Only discovering the origin of the deadly magic will allow them to set the people free of its destructive influence. 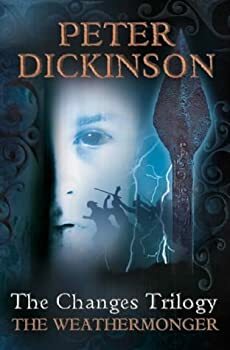 Peter Dickinson began writing the books after he’d had a nightmare. The trilogy is not sequential; rather, each book explores a different aspect of England during the time that simply became known as The Changes. Set in a vague idea of the future (or rather as the future may have looked to a writer in 1969) The Weathermonger opens with Geoffrey and Sally, two siblings left adrift on a rock in the sea by their community. Confused by a knock on the head, Geoffrey is informed by Sally that their uncle has been killed after being found working on a motorboat, and that the two of them have been left to be drowned when the tide comes in. I loved this book as a kid, and not just because it had naughty boobie pictures that had nothing to do with the text. 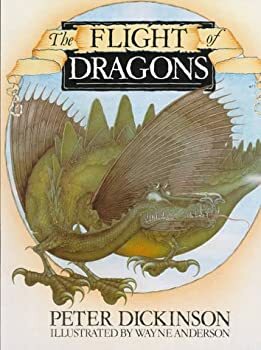 Dickinson takes the position that Dragons actually existed, then goes from there to ask questions like: why are they not in the fossil record? How could a creature that is generally depicted as huge and armoured supposedly fly? What’s the deal with the fire-breathing? Why are they often depicted as speaking and/or telepathic creatures? How come the accepted method of killing them is by a dude with a magic sword? The answers he comes up with were pretty convincing, at least to young me, and do a lot to fire the imagination. Let me start by saying I’ve never been much for short stories. It’s not that they can’t be well done, and I admit that it takes a huge talent to do them well, but I usually find myself frustrated and wanting more. Probably because I am used to reading full-length novels. That being said, I enjoyed reading Fire. 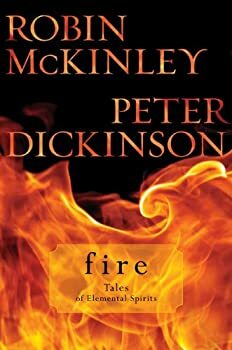 There are five stories, two by Robin McKinley and three by Peter Dickinson. I’m a huge fan of McKinley, but this is the first time I’ve read anything by Dickinson.